At least 20 people have been killed and more than 60 injured in a suicide car bombing outside the US headquarters in the Iraqi capital. The huge blast occurred at about 0800 (0500GMT) near Assassin's Gate - a heavily fortified entrance to one of Saddam Hussein's former palaces. Most victims are thought to have been Iraqis waiting to meet US officials. It is the deadliest attack since New Year's Eve and comes as the US tries to persuade the UN to return to Iraq. The US military is seeking clarification about whether two of those killed in the latest attack were American nationals. The chief US administrator in Iraq, Paul Bremer, said the attack was "an outrage - another clear indication of the murderous and cynical intent of terrorists to undermine freedom, democracy and progress in Iraq." "They will not succeed," he added in a statement. On Sunday evening, at least 13 people were injured in a bomb attack in the Shia holy city of Karbala. The blast happened in a busy street 2km away from the Shrine of Abbas, an important place of pilgrimage. It was the latest in a series of attacks on Iraq's majority Shia community, but it is not clear who was responsible. The Baghdad blast happened as Iraqis on business or seeking work were queuing to enter the complex on what is a normal working day in Baghdad. The compound - the Republican Palace in Saddam Hussein's time - is now the civilian and military headquarters of the US administration. 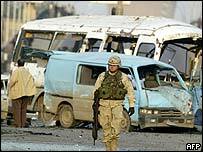 One thousand pounds (500 kg) of explosives carried in a white Toyota pick-up detonated outside the main entrance to the complex, said US military spokesman Colonel Ralph Baker. Six Americans, including two soldiers, were reported to be among the injured. Most of those who died were inside their cars when the fireball erupted, one coalition official said. "They didn't have a chance", he said. Iraqi police announced through loudspeakers that a reward would be given to anyone providing information on who carried out the attack. The last big car bomb attack in Baghdad was on New Year's Eve, when eight people were killed when a bomb exploded outside a busy restaurant in the city centre. The blast comes a day after a bomb attack on a patrol north of Baghdad took the number of American troops killed since the war began in Iraq in March last year to 500. Meanwhile as debate continues over the issue of how Iraq should be run in future, the US says it intends to ask the United Nations to back its plans for the transfer of power. Mr Bremer is to meet UN Secretary-General Kofi Annan on Monday in a drive to get the UN to return to Iraq. He is also expected to seek UN help in convincing the Shia majority that US proposals for an unelected transitional government are the best way to meet a July deadline for a handover of sovereignty. "The first major bomb in Baghdad this year has shattered hopes"